I love fried shrimp, but save them as a special treat… And these fried shrimp are the most special treat ever! My wife taught me how to make Ebi Furai (Japanese Fried Shrimp), and there are simply none better! It’s actually pretty easy, you’ve got to try it! 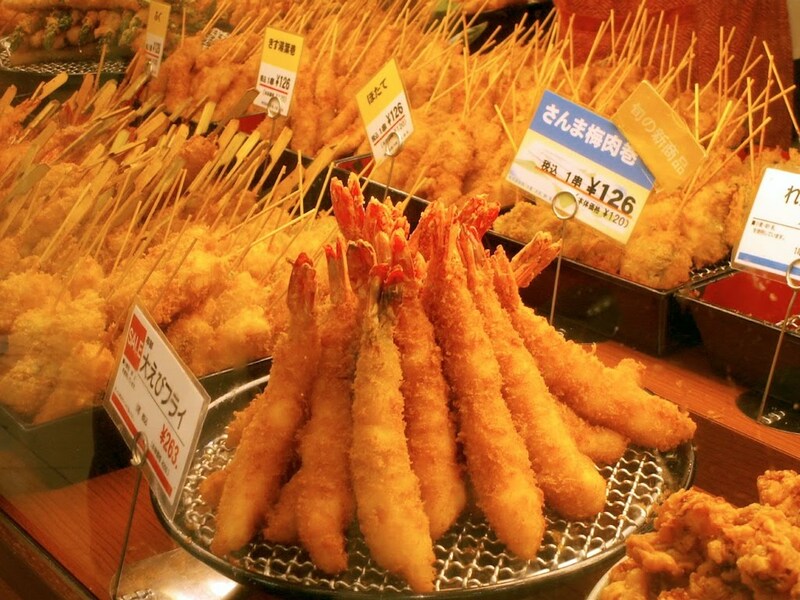 Ebi Furai in one of the four food courts in Yokohama Station, Japan. Keys to success with this dish: Start with GREAT shrimp in a large size, the shrimp in Japan is very good (and long and skinny, which looks nice) but nothing compares to wild American shrimp from the Gulf. Fry quickly in hot oil and immediately sprinkle with a dusting of fine sea salt, this will increase the crispiness and add just the right amount of salt – I suggest keeping pink sea salt in a fine salt grinder for light, even seasoning like this. For a lighter crust, skip the tempura, dredge in flour or cornstarch, then egg, then panko. 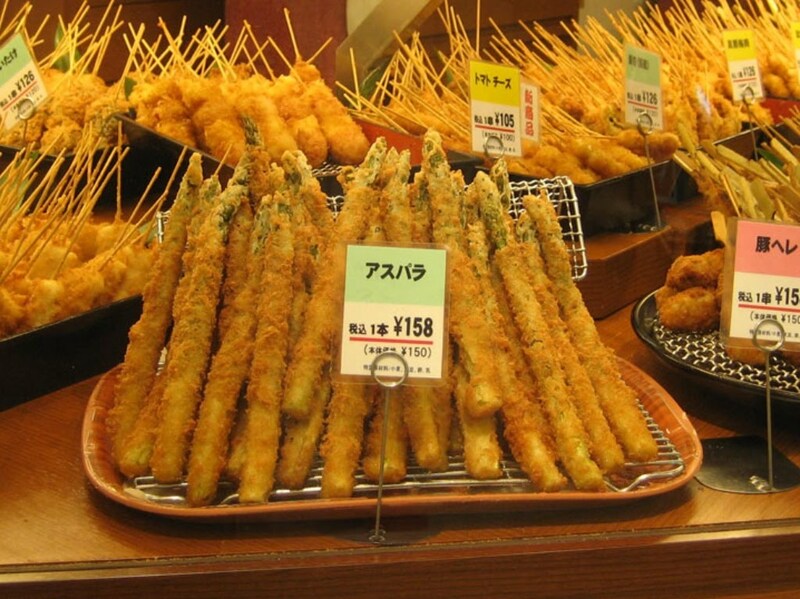 Crispy fried shrimp on a skewer that nobody can resist – possibly the ultimate appetizer! Ponzu sauce, East West Sweet or Spicy Ginger Dipping Sauce, Thai Chilli Sauce, Tony’s Cocktail or Remoulade Sauce – all available at Tony’s Markets. Prepare tempura batter according to package directions, but make it on the thin side. If making from scratch, use a one cup measuring cup. Measure flour into a medium bowl. In the same cup, add one egg and beat slightly, then add water to fill about 4/5 full and beat well. Whisk liquids into flour just to moisten; the batter should be like a thin, lumpy pancake batter with bits of flour still showing – adjust as needed and take care not to over stir or the batter will become tough (cake flour is lower in protein and gluten so it is much less apt to get tough). Peel and de-vein shrimp and while holding the shrimp flat, slide a bamboo skewer from tail to head of shrimp to straighten, leaving several inches of skewer as a handle. Take care not to poke the tip of the skewer through the top of the shrimp (if the skewer tips sticks out the end, the batter sticks to it making it hard to slide the shrimp off the skewer). Repeat with remaining shrimp. Dip shrimp in batter, and then toss in panko crumbs. Heat oil for to 360-380 degrees for frying.Holding onto the skewers, dip several battered and breaded shrimp at a time into hot oil, take care to keep them separated – you can prop against the sides of your pan, or hold the shrimp with the skewer. Fry shrimp quickly until golden brown, about 2-4 minutes depending on conditions, and then drain on a rack or paper towels. Immediately sprinkle hot shrimp with a dusting of fine sea salt. Chef’s Notes: In this recipe I used both batter and breading to increase the crust volume. 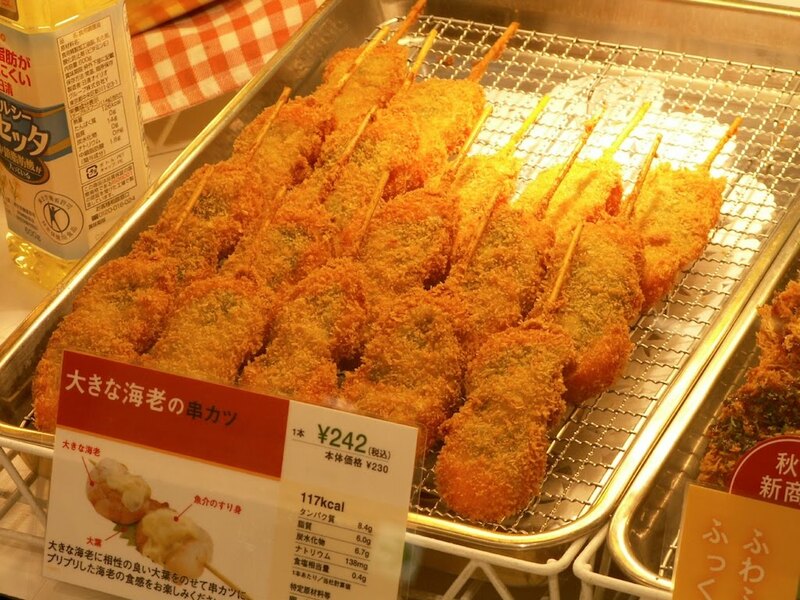 It’s also amazing (and traditional) just dusted in flour, dipped in egg and rolled in panko. Also fabulous with asparagus, mushrooms, squash coins, scallops, fish or whatever you feel like frying. Buon Appetito! The same dish with two smaller curled shrimp per skewer. Other variations include: whitefish, scallops, asparagus, chicken, squash, mushrooms, mini mozzarella balls and cherry tomatoes and more!